NEWPORT BEACH, Calif., April 3, 2019 /PRNewswire/ -- Chipotle Mexican Grill (NYSE: CMG), announced today that it's celebrating National Burrito Day by giving customers free delivery on orders $10 or more. 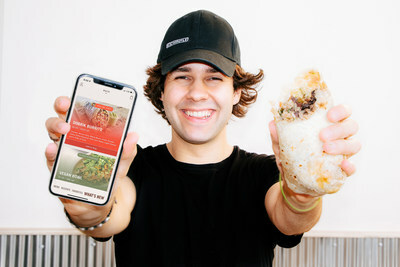 To celebrate further, Chipotle is partnering with YouTuber and super-fan David Dobrik by making his go-to Chipotle order the brand's official National Burrito Day burrito: the Dobrik Burrito. The Dobrik Burrito is made up of brown rice, black beans, chicken, mild salsa, two scoops of corn salsa, a sprinkle of cheese and a side of guac for dipping. This National Burrito Day exclusive is only available via digital orders on Chipotle's app and on chipotle.com, and is just one click away as a preconfigured menu item through Sunday, April 7. No matter what their orders are, guests can join in on National Burrito Day festivities by scoring $0 delivery fees tomorrow, April 4 on all orders $10 or more via the Chipotle app, Chipotle.com and through DoorDash. "We know a few things about burritos at Chipotle and we think that ultimately, National Burrito Day is about celebrating those who love burritos," said Chris Brandt, Chief Marketing Officer of Chipotle. "By making David's order a digital exclusive, we're able to celebrate one of our favorite days with his fans everywhere in a unique and personal way." This exclusive digital offer follows the launch of Chipotle Rewards. To start earning free Chipotle with Chipotle Rewards, customers can sign up in the Chipotle app or at Chipotle.com/Rewards. Those who enroll will earn 10 points for every $1 spent in the restaurant, online, or in the app with 1,250 points resulting in a free entrée. Free delivery offer is valid only for orders placed and fulfilled on April 4, 2019 from participating Chipotle locations within Chipotle and DoorDash's delivery areas, during normal operating hours for such locations. Maximum order size for free delivery is $200, excluding tax. Deliveries are subject to availability. Offer cannot be combined with other offers or promo codes and is non-transferrable. No adjustments to previous purchases. Valid only at order.chipotle.com or on the Chipotle app; not valid on orders placed via third party delivery platforms. Chipotle reserves the right to modify or terminate this offer at any time without notice. Additional restrictions may apply; void where prohibited. DoorDash is a technology company that connects customers with their favorite local and national businesses in more than 3,300 cities across the United States and Canada. Founded in 2013, DoorDash empowers merchants to grow their businesses by offering on-demand delivery, data-driven insights, and better in-store efficiency, providing delightful experiences from door to door. By building the last-mile delivery infrastructure for local cities, DoorDash is bringing communities closer, one doorstep at a time. Read more on the DoorDash blog or at www.doordash.com.